School Library Journal - 05/01/2015 PreS-Gr 2—More than an oversize alphabet book (and slightly less than most counting books). 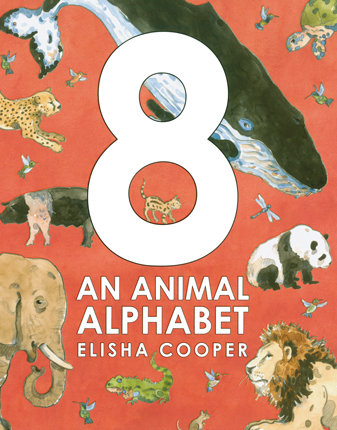 Cooper's 8 is filled with playful representations of animals both familiar and exotic. He explains that he chose the number "because 8 is round and adorable…not too big, and not so small, but just right." Each letter features several different animals including one type that's depicted eight times, which is what encourages the counting element of the book. Some may quibble that the animals are not drawn to scale (for instance, a dung beetle should not appear as large as a deer's tail), but the fun of seeing eight varieties of hummingbirds or being introduced to a yabby surely outweighs such petty complaints. All of the creatures are identified in the formidable pictorial "Did You Know?" section at the back. VERDICT Unusual in its conception and scope and illustrated with joy, this is an alphabet book to pore over, worth adding to any collection.—Miriam Lang Budin, Chappaqua Library, NY - Copyright 2015 Publishers Weekly, Library Journal and/or School Library Journal used with permission. Booklist - 05/15/2015 *Starred Review* Why 8? It’s Cooper’s favorite number! He invites readers to come inside this oversize volume and find out why he has had so much fun researching and creating this unusual alphabet book. Each page has the alphabet letter in uppercase and lowercase and features several true-to-life unnamed animals beginning with that letter. And the 8? There are 8 of one animal beginning with the alphabet letter on each page as well. What might have been just a simple alphabet book becomes a clever find-and-count game as well, adding to the book’s delightfulness. From albatross to earthworm, kudu to quoll, uakari to zebu, the realistic drawings of well-known and some lesser-known creatures are representative of the talented Cooper’s signature style. These radiant illustrations are done in pencil and watercolor on a generous background of white space. 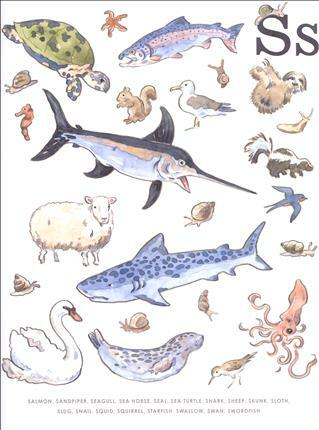 The extensive back matter lists brief facts about the 184 animals portrayed in the body of the book, on the title page, and on the endpapers, inviting children to find out more. It’s a feast of fauna! - Copyright 2015 Booklist.